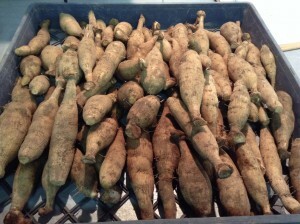 You are buying your tubers direct from the dahlia growers and the direct from the farm. Our tubers are plump, healthy single division tubers with at least one live eye. We have pictured labels with good information such as plant height, flowers size, etc on the label to help you create a gorgeous dahlia garden. Can I order dahlia tubers & perennials now? Yes! Our website is open for Spring 2019 orders now. We do one spring shipment per year. We plant in late spring, grow all summer, harvest in the fall, divide and prepare the tubers and perennials for shipping in winter. Then ship out the orders in the spring, when it’s approaching the correct planting time for your area. Our dahlias & perennials are packaged with full color labels with all the necessary information like how tall they grow, bloom size and type. All labels include a color picture of the plant. No, sorry we do not ship to Canada. When you order, this reserves your dahlias for spring shipment. We open up the barn every weekend in April for pick up orders and dahlia tuber sales in the barn. We’ll send you a reminder email prior to opening in April. Our dahlias are in bloom from September through mid October. Please call or email if you are interested in getting our fresh, farm to table cut flowers for your wedding or event. Please see our ‘Cut Flowers’ page for more information. We open up when it’s tuber season and when the dahlias are in bloom. Dahlia Tuber/Perennial Sales are held in the barn every weekend in April. We open up again when the flowers are in bloom, weekends in September for our annual Flower Festival. We guarantee to provide you with a tuber that has at least one live eye and will grow when given the proper conditions. Our dahlias are guaranteed to be free from virus and disease and we are a no pesticide, Salmon Safe farm. In your box of tubers, there will be detailed planting instructions that when followed, you will grow dahlias successfully. There are so many factors, once the tubers leave our farm that are beyond our control. We are not responsible for customer mistakes in growing dahlias. Please see our ‘Dahlia Care‘ page for detailed instructions on how to grow your dahlias. Subject to a 10% cancellation fee to cover online credit card processing fees and restocking.